Why are we here on this planet? What happens when we die? Is there such a thing as karma? Is there an afterlife? Is there a secret to healing the physical body? These are the mysteries James Schwartz set out to answer in One Voice, Sacred Wisdom, a groundbreaking exploration of spiritual questions we have all pondered. Using a process called alchemical hypnosis, he has gathered information from clients who were in direct communication with their guides and angels. And from those sessions—about life, death, karma, parallel planes, healing, and why we exist—come new insights that may challenge many of the spiritual beliefs that we have come to accept. Actual transcripts of clients experiencing the phenomena of visiting different planes of existence during their hypnosis sessions. A fascinating explanation—from the guides—of how parallel planes can actually exist and how time operates to accommodate them. A compilation of information from hundreds of guides who have shared heir wisdom in hypnosis sessions. 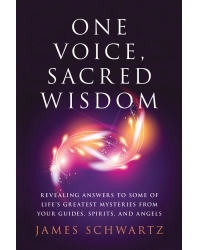 One Voice, Sacred Wisdom is a must-read guide for anyone searching for answers, whether you walk the path of traditional religion or are an independent seeker of spiritual truths. James Schwartz is a board certified hypnotherapist, NLP practitioner, and founder of the Rocky Mountain Hypnotherapy Center in Lakewood, Colorado. A graduate of Cal State Dominguez Hills and San Diego State University, Schwartz is a gifted teacher, speaker, writer, and musician. As a result of his extensive work with infertility clients, he wrote The Mind-Body Fertility Connection, a book which was endorsed by leaders in the fields of acupuncture, psychotherapy, hypnotherapy, and Maya massage. For more information about the author, you can visit the website for the Rocky Mountain Hypnotherapy Center at www.rmhypnotherapy.com.